This article is about the gameplay mechanic. For the naval tactic, see Boarding. "That first time he jumps on, the crowd just, you know, goes into this really loud cheering." 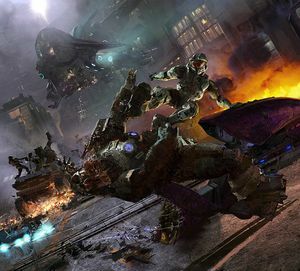 Boarding is a gameplay technique first featured in Halo 2 as a unique and interesting method of neutralizing an enemy vehicle by forcing the pilot to exit the vehicle and taking it over. It has become a staple gameplay feature in the Halo franchise, appearing in every subsequent game. Boarding, also called carjacking or hijacking, is the process of forcibly ejecting a vehicle's pilot and proceeding to take over the vehicle and use it against them. It is accomplished simply by holding X in Halo 2, Halo Reach, and Halo 4 or RB in Halo 3 (default controls) when near an enemy vehicle and the message "Hold [action button] to board Vehicle" appears. In Halo Wars, players may board by pressing Y when targeting an enemy vehicle, but only if a Spartan is selected and there is not already a Spartan in said vehicle. The main difficulty in boarding a vehicle is getting close enough to board it: a player attempting to board a vehicle can get splattered or killed by the vehicle's gunner. If the player succeeds, however, they will have disarmed their opponent and earned a free vehicle for their trouble, thus making it worth the risk. Players who succeed at boarding should be careful, as the other player may be able to re-board the vehicle. In Halo 3, when ejecting an enemy driver, the melee attack that takes place as you eject them severely damages the enemy and may even kill them if their shields are down. After being successfully boarded, there is a brief period of time when you are stunned and your moving speed is greatly decreased. In Halo 3, if the player is being boarded it is impossible to dismount the vehicle and try to escape — the player is trapped inside until the player is killed, ejected from the vehicle, or until the player kills the hijacker (by destroying the vehicle or forcing the hijacker into an obstacle). Concept art of John-117 boarding a Ghost for Halo 2. Boarding is most often done on Banshees, Ghosts, Brute Choppers, Hornets, and Falcons. The act begins with an animation in which the attacker jumps on top of the victim's vehicle and forces the victim out. The attacker then enters the vehicle and takes control over it. Ghosts and Choppers are the easiest to board because they only have forward firing guns, leaving them vulnerable from all other directions. Boarding a Warthog, Spectre, Prowler, or Revenant is different in that an attacker will still eject their victim, but without taking his or her seat. This can be dangerous as the player that was boarded can start shooting the attacker while the attacker is still returning to first-person view. These vehicles, within the exception of the Revenant also have turrets, making it difficult to get close enough to board them, and leaving an attacker vulnerable to fire from the turrets while boarding. These vehicles can still be neutralized by boarding them, however; ejecting the driver leaves the gunner a sitting duck, and ejecting the gunner makes the vehicle less dangerous. In battle, it is possible to board the passenger seat of a Warthog, emptying it; from there, you can enter the Warthog and melee the driver to death. You will, however, have to hop out and circle around the vehicle to take control of it after you kill the driver. In Halo: Reach, when boarding a Warthog/Revenant, the boarder takes place of the driver/passenger/gunner which makes it easier to take control of the vehicle. However, in campaign, boarding these vehicles will forcibly eject all characters from it if there is another enemy manning another part of the vehicle. Boarding works quite differently on Scorpions and Wraiths. The attacker does not eject the victim or take their seat. Instead, the boarder jumps onto the target vehicle. From that position, they may melee the vehicle—exposing and eventually killing the driver—or they may plant a grenade, killing all occupants, destroying the vehicle, and endangering themselves. A Scorpion or Wraith's gunner can fire upon any players that attempt to board the vehicle; for this reason, attackers should make sure to kill the gunner before boarding the tank. Scorpion/Wraith boarding is different in every game. In Halo 2, the player has to melee the hatch off before planting a grenade and the person being boarded can jump out. In Halo 3 both attacks are much faster, the grenade can be shoved through the hatch, and the occupant is trapped in the vehicle. Halo 3: ODST is the same as Halo 3, although the distance from which you can board seems to be larger. In Halo 3: ODST, Wraiths can be boarded like in Halo 3 and the player can still melee or use grenades against the drive. However, the Wraith is rigged to explode when the driver dies or exits the vehicle. There is a method to overcome this and capture a wraith, however. The Mongoose in Halo 3 cannot be boarded; a player could only melee the driver off as they pass by. Alternatively, an attacker can enter the rear passenger seat of a target's Mongoose and then kill the driver with a few quick melee attacks or shots to the back of the head, although such a maneuver would take almost perfect timing and precision. The Mongoose can be boarded in Halo: Reach. If the boarding action is performed on a Mongoose with both driver and passenger onboard, the boarding action counts as a melee attack to both of them at once. The Mantis is one of the more difficult vehicles to board, due to its sheer offensive capabilities, height, and shielding. There is no game prompt for boarding if a Spartan simply stands at ground level with the Mantis. The boarder must jump or be suspended in air in order to reach the cockpit. Dropping down on the Mantis from an elevated height or being level with the cockpit also works and is preferably safer. However, due to its size it is also prone and vulnerable to EMP shots from Plasma Pistols. This brings it to a crouched deactivated state and thus makes boarding much easier. A simple tactic to boarding an enemy is to have it crash into an immovable object or a wall. The vehicle will then have limited movement, allowing it to be boarded. However, this is more difficult against a Ghost, a Spectre, or a Revenant since it can move in all directions. In Halo 3 and newer Halo titles, boarding tactics have been made easier with the introduction of EMP effect on vehicles. An electromagnetic pulse created from a charged Plasma Pistol shot, round detonated manually from a Grenade Launcher, or a Power Drain will quickly disable the vehicle's engines, leaving it completely vulnerable to boarding. A player can indisputably avoid being boarded simply by constantly moving at full speed, sometimes even scoring some splatters along the way. However, if a player voluntarily exits the vehicle before they are ejected, they may be able to re-board the captured vehicle. Additionally, if the player is boarded while inside a Banshee, a maneuver called "The Great Banshee Switch" can be used to recover the vehicle. In some scenarios, the best method to deny the hijacker the opportunity to commandeer the vehicle. One method involves quickly throwing a plasma grenade or a spike grenade at the vehicle after the player is ejected from the vehicle, destroying the vehicle and killing both players. Alternatively, the player being boarded can drive off the multiplayer map (such as Standoff or Avalanche) before the hijacker ejects the player from the vehicle seat. In the Halo 2 campaign level Regret, players have to board the Prophet of Regret's gravity throne and melee the Hierarch in order to eliminate him. SPARTAN-IIs can hijack vehicles in Halo Wars. They can do this to an enemy vehicle to commandeer it, or make one of your own units more powerful. Strangely, if they hijack an enemy Warthog that has a passenger or turret, they will only hijack the driver yet the turret and passenger will also become theirs. In Halo 3, if you are playing a FFA matchmaking playlist, and can re-board a vehicle you have been kicked out of within ten seconds, you will earn the "Maybe Next Time Buddy" achievement. In multiplayer, a successful boarding of a ground vehicle will award the player the Carjacking Medal. If the player boards an aircraft, the Skyjacker Medal is awarded instead. Elites in Halo: Reach may board vehicles, including campaign essential ones such as the Falcon ridden in Tip of the Spear. However, they will be very bad at flying it, and the hijacking will result in the level being disrupted and the player unable to continue, at which point they must reset at a checkpoint. During the development of Halo: Reach, Bungie expanded the boarding mechanic by attaching it to character models, such as Hunters and Gúta; players could either plant a grenade into the back of the creature or melee it to death. This mechanic was eventually cut before release. However, the similar assassination mechanic, which targets smaller opponents, did make it into the game. Master Chief pulls a similar stunt in Halo 4: Forward Unto Dawn, where he leaps onto a Hunter and plants a grenade in it. An Elite prepares to hijack a Spartan. A Spartan getting ready to eject a Ghost's pilot. A Spartan hijacks another Spartan from a Ghost. A Spartan ejects a rival Spartan in the Halo 3 Beta. A SPARTAN-II boarding a Wraith. An Elite boards a Mongoose in Halo: Reach. A Red Spartan hijacking a Blue on a Mongoose.